Considered to be the father of photojournalism, Cartier-Bresson began photographing in the 1930s, and was one of the five founding members of the prestigious agency Magnum Photos in 1947. Yet, above and beyond his many iconic photographs, his use of a simple phrase transcended into holy verse in the context of photography: the decisive moment. Cartier-Bresson published a collection of his images, his first real photobook, under the name The Decisive Moment in 1952 (Simon and Schuster) concurrently with the French version, titled Images à la Sauvette (Editions Verve). The book begins with an essay by Cartier-Bresson on the art and practice of photography, which he opens with a quote by the 17th century Cardinal de Retz, “Il n’y a rien dans ce monde qui n’ait un moment decisif”: There is nothing in this world that does not have a decisive moment. The photos of The Decisive Moment are divided into two sections, Photographs of the Occident and Photographs of the Orient. However, shown without the context of their original photojournalistic stories, rather than telling a geographic tale, they serve much more richly as a biography of the artist. In the early years of his photography, shortly after discovering the Leica camera, Cartier-Bresson describes that he “prowled the streets all day, feeling very strung-up and ready to pounce, determined to ‘trap’ life – to preserve life in the act of living.” He continues: “Above all, I craved to seize the whole essence, in the confines of one single photograph, of some situation that was in the process of unrolling itself before my eyes.” It was only later, he says, that he learned to work towards the art of reportage or picture-stories. From a practical perspective, Cartier-Bresson’s book can easily operate as a ‘how-to’ guide to creating images that are meaningful in content, masterful in technical skill, and moving emotionally. (Or, as he put it himself: “The picture-story involves a joint operation of the brain, the eye and the heart.”) It’s the meeting of these qualities that made Cartier-Bresson the master that he was, and that renders The Decisive Moment such a jewel of a book. Because, didactic as it is for a learning photographer, it also touches deeply on a human level, inspiring both creatively and compassionately. 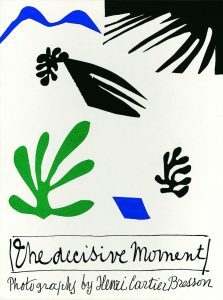 The Decisive Moment was published in GUP#44, the Raw issue, and then later online at GUP Magazine.